I’d like to share a technique I’ve picked up for mounting prints. I enter a lot of local exhibitions and art contests. A lot of these require that you mount, mat and frame your artwork. This would get prohibitively expensive after a while, so I’ve come up with methods for quick mounting and reusing frames. As I have explained before, I tend to standardize on certain aspect ratios and sizes of prints. 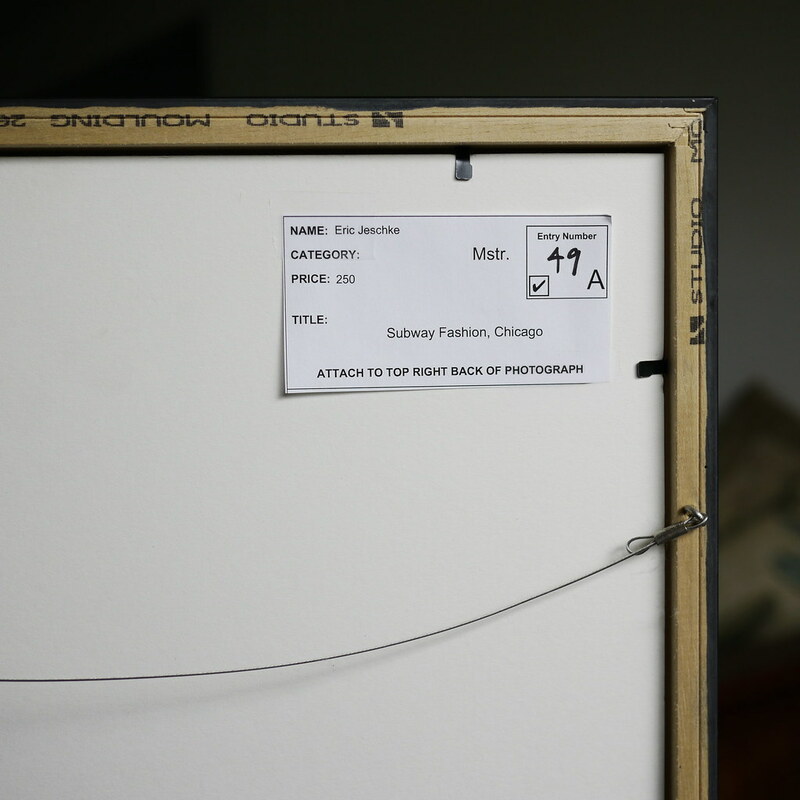 This allows me to purchase a number of high quality frames with matching archival quality mount and mat board. While I used to use hinging, it always left residue (or worse) on the prints when I removed them after the show. I have now settled on using Art Saver mounting strips. 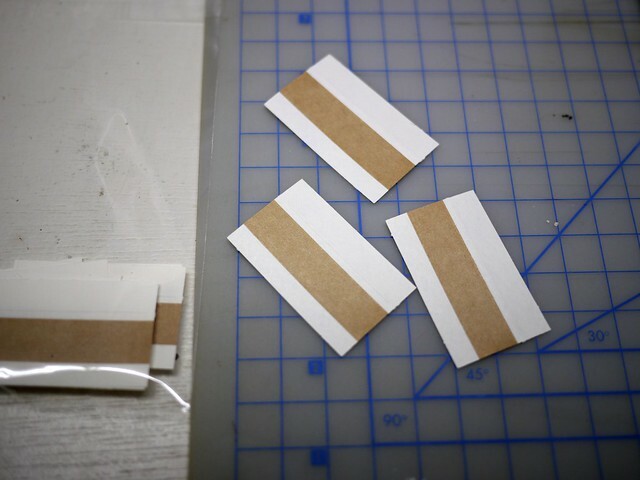 These are pH-neutral, 100% cotton strips with a crease and adhesive strip on one side. The beauty of these guys is that you apply them to a mount board and then you can freely swap identically-sized prints in and out of these frames without any major hassle. Place the image on the mount board and position to taste. Notice how I place a small ink dot in each corner to mark the position for the print accurately. 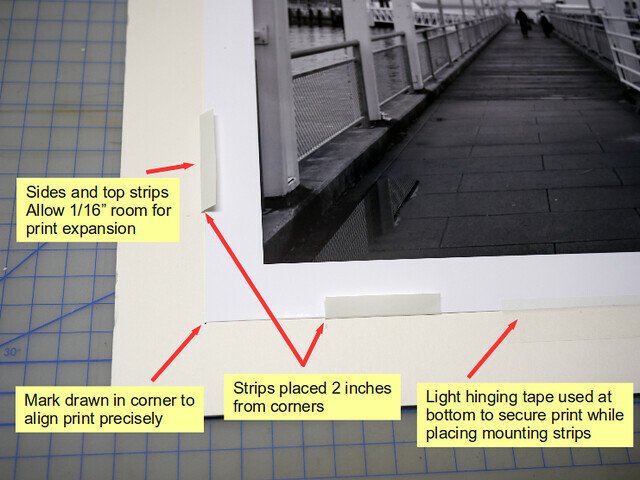 I place a small strip of hinge tape to anchor the print to the mount board for the initial mounting of the strips. For subsequent prints this is not necessary. For smaller sized prints you can get away with 2 strips per side of the print. For larger prints you may need 3-4 per side. You simply fold the strips on the crease, burnish the crease, peel off the adhesive, and adhere the strip into position around the print, with the adhesive strip side down on the mount board and the crease folding over onto the top of the print, as shown. The bottom strips should be flush with the print in the crease. For the side and top strips you should leave approximately 1/16″ of expansion room for the print in case it swells due to humidity or other factors. Lay the mat over the top of the print and slide it into the frame. I use the bendable metal pins to hold the mount board into place (as shown here), so it is simply a matter of bending them back into position after the mount/mat combo is slipped back into the frame. Although I live in a very humid climate, I’m not inclined to dry-mount or adhesive-mount my prints to mount board. For one thing it is time consuming. For another thing it gets to be expensive to buy all that mount board. 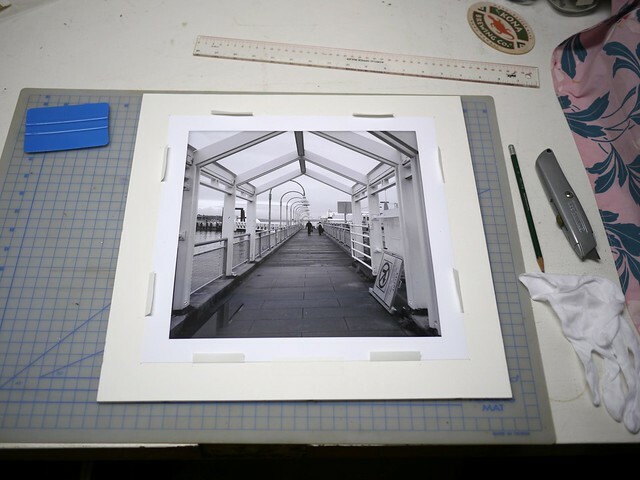 This technique allows me to store the prints very compactly until I want to put one in a frame for viewing. It is interesting to note that art museums and other places that really care about the longevity of art work also do not recommend destructive mounting. They prefer hinging or techniques like this that allow the print to be remounted later without having to damage the print trying to remove it from a decayed mount board. Thanks, Eric. Above just may encourage me to get more than one print to be enlarged & framed without too much expense. Could you point to URL(s) about (compactly) storing the prints if you have had written about that in past? I don’t have a URL (or don’t remember writing that up explicitly as a blog entry), but currently I store my prints in old boxes that my A3+ paper comes in. Each box stores about 20 prints in a thickness of less than a centimeter. However, I have some plans to get larger archival boxes (ph neutral) for storing these, something like these. Oh, and BTW, here is a source for the Art Savers, called Talas. it looks like a good source for archival supplies. Don’t know if they ship to Hawai’i, though. Thanks for the update, Eric.